February proved to be goodish on the book-buying front. I bought two books. So I'm now a bit ahead of where I should be with my book-buying, but I hope I can be more restrained somewhere later in the year to compensate. As with my clothes buying challenge last year, limiting my book-buying has revealed previously unacknowledged habits and attitudes. One of the things I've discovered about myself is that I find it almost impossible, if I'm by myself, to have a coffee or lunch out without a book to read. It must be the kind of deep association that cigarette smokers have with drinking tea or coffee. It's not that I'm at all embarrassed or uncomfortable about eating alone in public - in fact, I quite enjoy it. I don't feel the need to retreat behind a book. Maybe it's just because I was never allowed to read at the table as a child that I find reading while eating so pleasurable. I blame my first book purchase for the month on that habit. I was in the city and needed to have lunch and I didn't have a book with me. I felt a deep need to have a book to read and so I bought Anne Enright's 2007 Booker prize-winning novel 'The Gathering'. I'm deeply concerned about the viability of publishers and publishing in the transition from real books to e-books. I don't disapprove of e-books. I think anything that makes reading easier, more accessible and pleasurable for people is to be lauded. But I am concerned that publishers find ways to continue to make book production profitable so that good writing gets published. One of the outcomes of this rethinking of publishing practices seems to me to be an outbreak of schemes to market cheap books. In Australia, where inscrutable world-wide book distributing agreements have meant very expensive books for many years, this is an unexpected pleasure. This book of Anne Enright's was only $9.95 as it was part of a celebration of Vintage's first 21 years as a publisher. They republished 21 of their most successful books. A present for their readers. Buying Charles Dickens 'Our Mutual Friend' was a mistake; but not a mistake I will regret. My book group had decided we should read or reread some 'classics' and decided on 'Dombey and Son'. 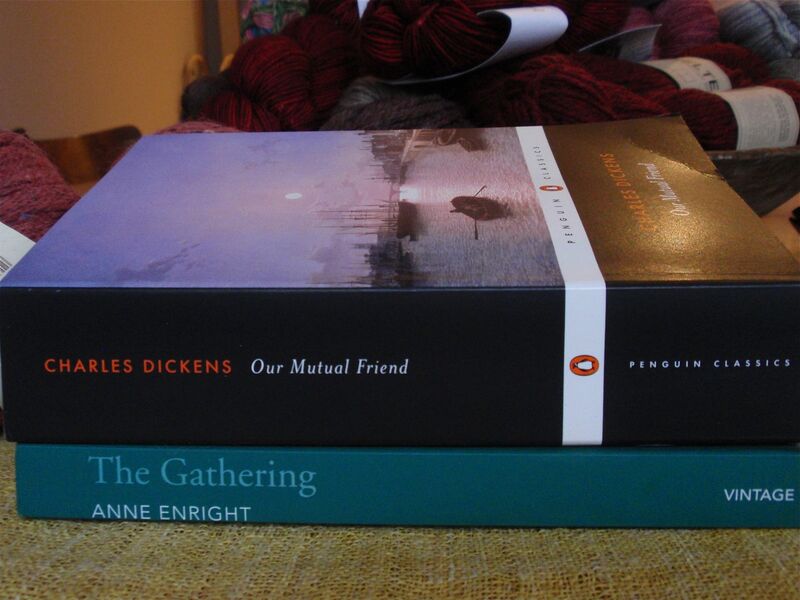 For some reason I thought the book we'd selected was 'Our Mutual Friend' and bought a copy. I've now discovered my mistake. But I suspect reading one Dickens will make me want to read another, so this can happily join my growing pile of books to read in 2012. And it also cost only $9.95. For whatever reason (copyright?) 'classics' are sold more cheaply. Dickens is very good value reading - you get lots of words for your dollar! My 2012 reading has been slowed down over the last few weeks by reading Frank Moorhouse's doorstop of a book - 'Cold Light', which I hasten to add was a Christmas gift - I didn't buy it. Such a wonderful read. It's the third book in a trilogy about Edith Campbell Berry, who, as a young woman leaves Australia to work for the League of Nations in the cause of world disarmament. By this final book in the trilogy Edith returns to Australia in 1950 after the second world war doomed the ideals of the League of Nations and she finds herself out of a job. Edith settles in Canberra in the vain hope of gaining a diplomatic position, but finds herself caught up in the planning of Canberra and the movement to resist the banning of Communism. The book is a most wonderful combination of a personal story and political and diplomatic settings and events. Thoroughly recommended for whenever you need a BIG book to read. 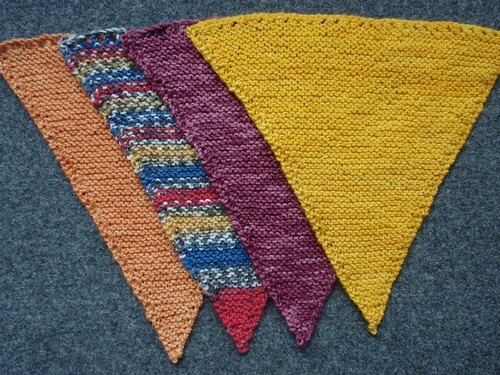 I've called an end to my bunting flag knitting. Ten bunts. 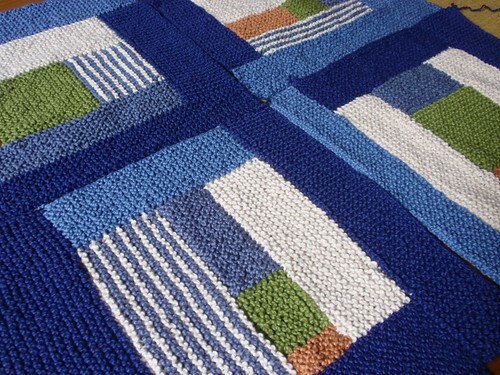 It's easy, addictive knitting - so addictive I could just keep knitting bunts until I run out of odds and ends of sock yarn. 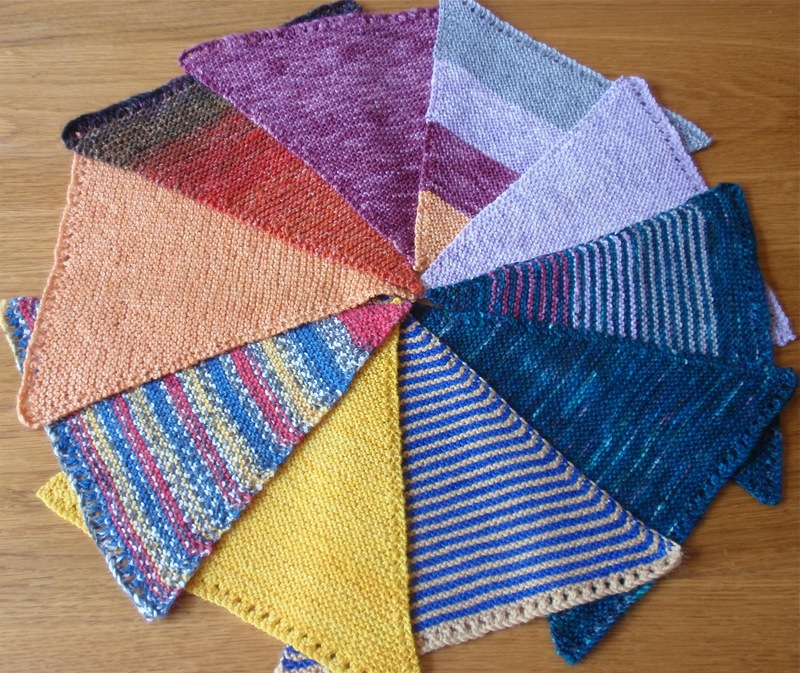 As I was knitting the bunts I found myself becoming more adventurous with mixing yarns in various combinations of stripes - partly because it used up the bits and pieces of yarn I had, but also because with repetitive tasks it's almost impossible not to try variations on a theme. I love variations on a theme. But ten bunts is enough. I could go on, but it's distracting me from other knitting. 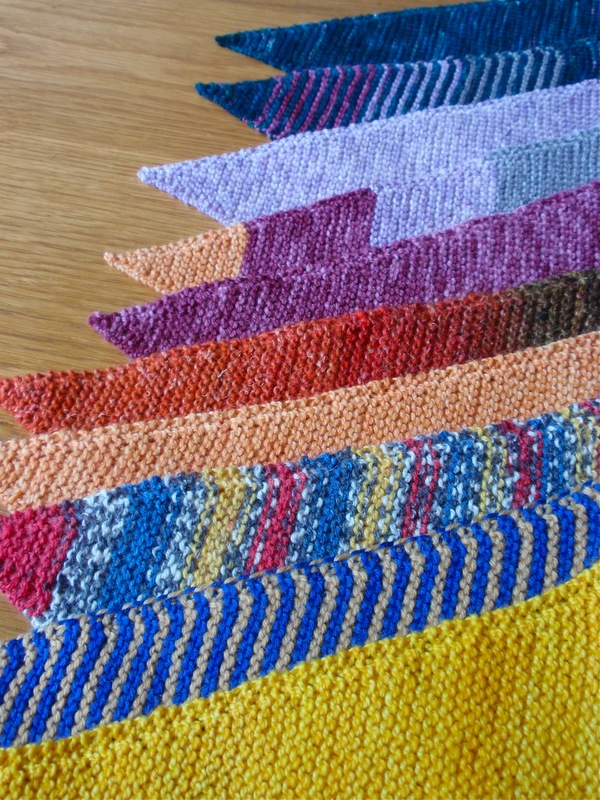 And with all the reports of bunting on blogs, ravelry and facebook, I'm sure we'll have enough for our strings of bunting for the Royal Easter Show. It's taken me ages to finish these socks. There were several stops and restarts - the final one just a few rows short of the toe on the second sock. My enthusiasm for sock knitting seems to have dwindled; I hope only temporarily. There are pluses and minuses to these socks. 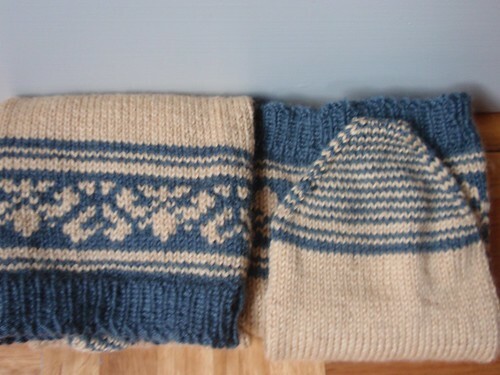 I really like the colour combination - camel and grey. A very classic combination. 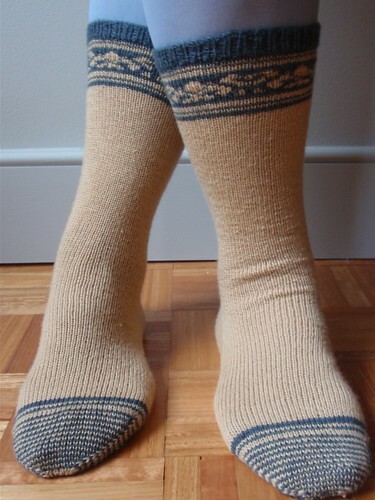 I like the plainness of the old-fashioned Patonyl sock yarn in stocking stitch and the slightly irregular fine stripes on the toes. However, I think the patterned band at the top of the socks doesn't really work well. The fleur de lys and heart pattern is lovely before you put on the sock, but once the pattern is stretched around my admittedly generously sized legs the pretty pattern is distorted. 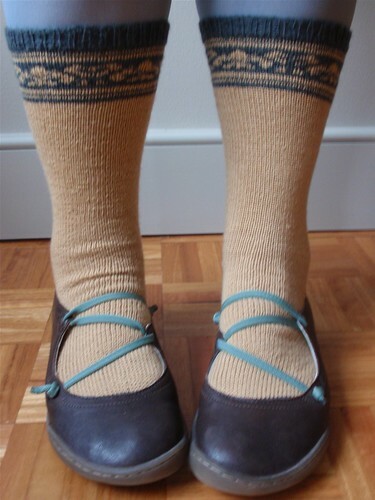 Maybe a fair isle pattern would work better around the ankle where the fabric is not stretched to the same extent. The fair isle motifs and stripey toes are taken from Kristen Kapur's Sockstravaganza pattern that features in Julie Turjoman's book "Brave New Knits'. 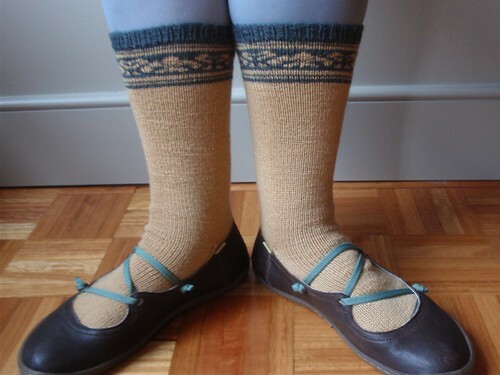 But I omitted the cabling and travelling stitches on the body of the socks to limit their extravagance. I forgot to post about my progress with my personal challenge to buy only 12 books in 2012. So far, so good. 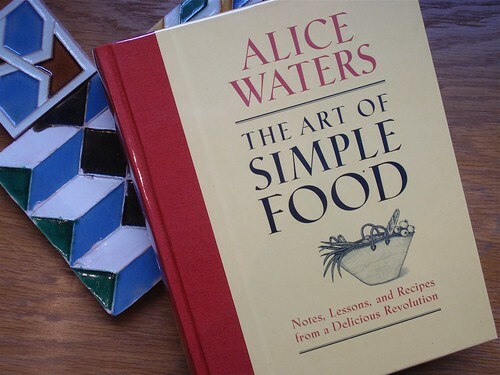 I bought only one book - Alice Waters' cookbook 'The Art of Simple Food' which, though published only in 2007, is already well on the way to becoming a classic. I'm hoping it will inspire me to cook simple meals with fresh ingredients, frequently. Once upon a time I think I was regarded as quite a competent cook; but living by myself has made me lazy. I'm fully aware that buying cookbooks has a kind of magical quality to it - you trick yourself into believing that somehow the act of buying the book will of itself improve the quality of your cooking. I know what I really need to do is overcome my laziness about putting effort into cooking for myself: but I am hoping that the new book will provide sufficient inspiration to overcome my laziness. By the way, I've added an exception to my no-book-buying resolution. I'm allowed to buy gift books for others. This is a necessary variation as I just couldn't manage without buying books for my grandchildren. Even though I've not bought books I have been reading. Mainly I'm still reading books I was given at Christmas time and books I bought last year. I also read some of my daughter's books when I was staying at her place. So far I haven't lacked for very pleasurable things to read. But this challenge has made me realise that I'm in the habit of just popping into bookshops if I have a few minutes to spare. The Bookshop of Doom in the Devonshire Street tunnel is a particular temptation on my way home from work, and a visit to the city seems incomplete without a few minutes in Kinokuniya.